2002-03-04 Assigned to KIMBERLY-CLARK WORLDWIDE, INC. reassignment KIMBERLY-CLARK WORLDWIDE, INC. ASSIGNMENT OF ASSIGNORS INTEREST (SEE DOCUMENT FOR DETAILS). Assignors: WAUGAMAN, MARLENE R., STRACK, DAVID C., VARONA, EUGENIO G., MACE, TAMARA L., GRIFFIN, REBECCA W., WULZ, ANDREA S., PAUL, SUSAN C., SMITH, ROLAND C., JR. The present invention relates to an absorbent article for absorbing fluids and exudates, such as urine. More particularly, the present invention relates to absorbent garments which are configured to absorb body exudates while also helping to reduce the relative humidity in the environment of the article, to reduce skin-exudate contact and to reduced undesired skin hydration. The present invention relates to an absorbent article having a front waist section, a rear waist section, and an intermediate section which interconnects said front and rear waist sections. One embodiment of the absorbent article generally includes: a topsheet having a body-facing surface; a backsheet; an absorbent; and a resilient material positioned between topsheet and the backsheet. The resilient material creates at least one contour which promotes movement of fluid away from one region of the article to another region of the article. The contour of the resilient material desirably creates a hill-like structure. Many known diaper configurations employ absorbent materials located between a liquid pervious topsheet and a vapor and liquid impermeable backsheet. Such backsheets are well suited to prevent the migration of liquid waste from the absorbent materials to the outer garments of a wearer. Unfortunately, the use of liquid and vapor impermeable backsheets can result in a high degree of humidity within the diaper when in use which may result in relatively high skin hydration levels. The occlusive, moist environment inside diapers incorporating such backsheets can promote the viability of microorganisms, including  Candida albicans, which can undesirably lead to the onset of diaper dermatitis (diaper rash). Diaper dermatitis can afflict almost every infant at some time during the diaper wearing years. The most severe form of this condition is usually caused by secondary infection with the fungi  Candida albicans. 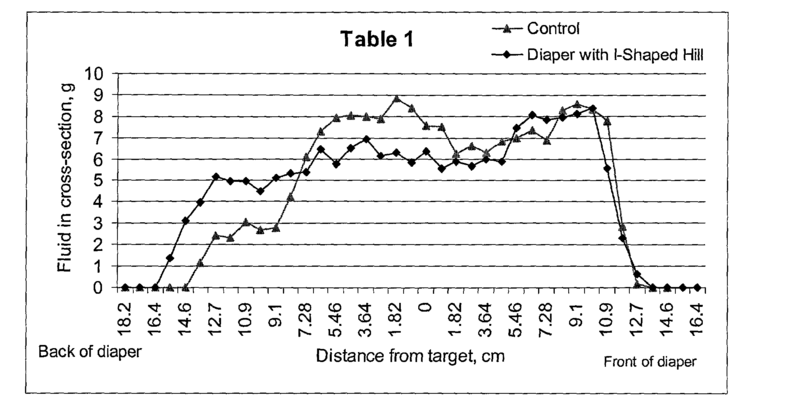 Although other factors influence the pathogenesis of this fungi, one critical factor is the relative humidity within the diaper which is directly related to the occlusion or semi-occlusion of the diaper area. Yet another embodiment of the present invention defines a diaper having a front waist section, a rear waist section, and an intermediate section which interconnects said front and rear waist sections. More specifically, the diaper includes: a) a vapor permeable outercover with WVTR of at least about 1000 g/m 2/24 hr; b) a liquid permeable liner; (c) an absorbent body located between the outercover and the liner; (d) a surge layer; (e) a vapor barrier between the absorbent body and the liner; and (e) a resilient material. The resilient material is positioned in the intermediate section of the diaper, and has sufficient elevation so as to promote flow of an insulting liquid to one or more other regions of the diaper so as to change the fluid profile in the diaper. In at least one embodiment of the diaper, the absorbent body may be absent from the insult area of the absorbent article. FIG. 7 representatively illustrates the cradle and weight used to the test the materials described in the Examples. As used herein, the term “biconstituent fibers” refers to fibers which have been formed from at least two polymers extruded from the same extruder as a blend. The term “blend” is defined below. Biconstituent fibers do not have the various polymer components arranged in relatively constantly positioned distinct zones across the cross-sectional area of the fiber and the various polymers are usually not continuous along the entire length of the fiber, instead usually forming fibrils or protofibrils which start and end at random. Biconstituent fibers are sometimes also referred to as multiconstituent fibers. Fibers of this general type are discussed in, for example, U.S. Pat. No. 5,108,827 to Gessner. Bicomponent and biconstituent fibers are also discussed in the textbook  Polymer Blends and Composites by John A. Manson and Leslie H. Sperling, copyright 1976 by Plenum Press, a division of Plenum Publishing Corporation of New York, IBSN 0-306-30831-2, at pages 273 through 277. As used herein the term “microfibers” means small diameter fibers having an average diameter not greater than about 75 microns, for example, having an average diameter of from about 0.5 microns to about 50 microns, or more particularly, microfibers may have an average diameter of from about 2 microns to about 40 microns. Another frequently used expression of fiber diameter is denier, which is defined as grams per 9000 meters of a fiber and may be calculated as fiber diameter in microns squared, multiplied by the density in grams/cc, multiplied by 0.00707. A lower denier indicates a finer fiber and a higher denier indicates a thicker or heavier fiber. For example, the diameter of a polypropylene fiber given as 15 microns may be converted to denier by squaring, multiplying the result by 0.89 g/cc and multiplying by 0.00707. Thus, a 15 micron polypropylene fiber has a denier of about 1.42 (15 2×0.89×0.00707=1.415). Outside the United States the unit of measurement is more commonly the “tex”, which is defined as the grams per kilometer of fiber. Tex may be calculated as denier/9. As used herein, a substantially vapor permeable material is constructed to provide a water vapor transmission rate (WVTR) of at least about 100 g/m 2/24 hr, desirably at least about 250 g/m2/24 hr, and more desirably at least about 500 g/m2/24 hr. A suitable technique for determining the WVTR value is the Water Vapor Transmission Rate Test which is described in further detail herein below. The relative humidity within the oven is not specifically controlled. Under predetermined set conditions of 100° F. and ambient relative humidity, the WVTR for Celguard 2500 has been determined to be 5000 g/m 2/24 hours. Accordingly, Celguard 2500 is run as a control sample with each test. Celguard 2500 is a 0.0025 cm thick film composed of a microporous polypropylene. Examples of suitable constructions of absorbent articles for use in the present invention are described below and representatively illustrated in FIGS. 1-6. FIG. 1 is a representative plan view of an integral absorbent garment article, such as disposable diaper 10, of the present invention in its flat-out, uncontracted state (i.e., with all elastic induced gathering and contraction removed). Portions of the structure are partially cut away to more clearly show the interior construction of diaper 10, and the surface of the diaper which contacts the wearer is facing the viewer. FIG. 2 representatively shows a sectional view of the absorbent article of FIG. 1 taken along line 2-2. With reference to FIGS. 1 and 2, the disposable diaper 10 generally defines a front waist section 12, a rear waist section 14, and an intermediate section 16 which interconnects the front and rear waist sections. The front and rear waist sections include the general portions of the article which are constructed to extend substantially over the wearer's front and rear abdominal regions, respectively, during use. The intermediate section of the article includes the general portion of the article which is constructed to extend through the wearer's crotch region between the legs. One skilled in the art will appreciate that the size and/or location of the crotch region area of an absorbent article may vary depending on the whether the product was designed for a male, female or both, as well as the age of the intended user. Although it is contemplated that in most embodiments the insult or target area will desirably be within the crotch region of the article, it is recognized that under some circumstances or embodiments, an insult may occur outside of the target area or crotch region, and nothing in this disclosure is in any way intended to limit the scope of this disclosure such that if such an event occurs that it is not covered herewith. The absorbent article includes a vapor permeable backsheet  20, a liquid permeable topsheet 22, and an absorbent body or material 24, such as an absorbent pad or the like, which is located between the backsheet 20 and the topsheet 22. The backsheet 20 defines a length and a width which, in the illustrated embodiment, coincide with the length and width of the diaper 10. The absorbent body 24 generally defines a length and width which are less than the length and width of the backsheet 20, respectively. Thus, marginal portions of the diaper 10, such as marginal sections of the backsheet 20, may extend past the terminal edges of the absorbent body 24. In the illustrated embodiments, for example, the backsheet 20 extends outwardly beyond the terminal marginal edges of the absorbent body 24 to form side margins and end margins of the diaper 10. The topsheet 22 is generally coextensive with the backsheet 20 but may optionally cover an area which is larger or smaller than the area of the backsheet 20, as desired. The backsheet 20 and topsheet 22 are intended to face the garment and body of the wearer, respectively, while in use. It is also contemplated that the absorbent body 24 may be made up of one or more zoned sections of absorbent material and which may or may not be adjacent or in fluid communication with the other sections. Examples of suitable zoned absorbents, include, but are not limited to those disclosed in commonly assigned U.S. patent application Ser. No. ______, entitled “AN ABSORBENT ARTICLE EXHIBITING IMPROVED FLUID DISTRIBUTION”, filed in the names of Wulz et al. on Dec. 20, 2001 (Attorney Docket No. 16,891), the disclosure of which is herein incorporated by reference in its entirety. The permeability of the backsheet is selected to enhance the breathability of the absorbent article to reduce the hydration of the wearer's skin during use without allowing excessive condensation of vapor on the garment facing surface of the backsheet  20 which can undesirably dampen the wearer's clothes. To provide improved fit and to help reduce leakage of body exudates from the diaper  10, the diaper side margins and end margins may be elasticized with suitable elastic members, such as single or multiple strands of elastic. The elastic strands may be composed of natural or synthetic rubber and may optionally be heat shrinkable or heat elasticizable. For example, as representatively illustrated in FIGS. 1 and 2, the diaper 10 may include leg elastics 26 which are constructed to operably gather and shirr the side margins of the diaper 10 to provide elasticized leg bands which can closely fit around the legs of the wearer to reduce leakage and provide improved comfort and appearance. Similarly, waist elastics 28 can be employed to elasticize the end margins of the diaper 10 to provide elasticized waists. The waist elastics are configured to operably gather and shirr the waist sections to provide a resilient, comfortably close fit around the waist of the wearer. In the illustrated embodiments, the elastic members are illustrated in their uncontracted, stretched condition for the purpose of clarity. Fastening means, such as hook and loop fasteners  30, are employed to secure the diaper on a wearer. Alternatively, other fastening means, such as buttons, pins, snaps, adhesive tape fasteners, cohesives, mushroom-and-loop fasteners, or the like, may be employed. The diaper  10 may further include other layers between the absorbent body 24 and the topsheet 22 or backsheet 20. For example, as representatively illustrated in FIGS. 1 and 2, the diaper 10 may include a ventilation or spacer layer 32 located between the absorbent body 24 and the backsheet 20 to insulate the backsheet 20 from the absorbent body 24 to improve air circulation and effectively reduce the dampness of the garment facing surface of the backsheet 20. The ventilation layer 32 may also assist in distributing fluid exudates to portions of the absorbent body 24 which do not directly receive the insult. The diaper 10 may also include a surge material or surge management layer 34 located between the topsheet 22 and the absorbent body 24 to prevent pooling of the fluid exudates and further improve air exchange and distribution of the fluid exudates within the diaper 10. In one or more embodiments, it may be desirable for the surge management layer 34 to be superabsorbent-free or substantially superabsorbent-free. In alternative embodiments, it may be necessary for the surge to have an increased capacity which may be achieved by the inclusion or incorporation of superabsorbent particles or the like. The present invention may further include a vapor barrier. The vapor barrier is desirably positioned between the absorbent and the topsheet (or surge, if present) so as to reduce the amount of evaporative moisture the skin of a wearer is exposed to. The vapor barrier may be a film, nonwoven, nonwoven/film laminate, foam or the like. Desirably the vapor barrier is, at least in part, a breathable film, but may be any other suitable breathable barrier known to those skilled in the art. Furthermore, it is contemplated that the vapor barrier may be apertured. It is also contemplated that the vapor barrier may be zoned or selectively applied or positioned in one or more regions of the article. The diaper  10 may be of various suitable shapes. For example, the diaper may have an overall rectangular shape, T-shape or an approximately hour-glass shape. In the shown embodiment, the diaper 10 has a generally I-shape. 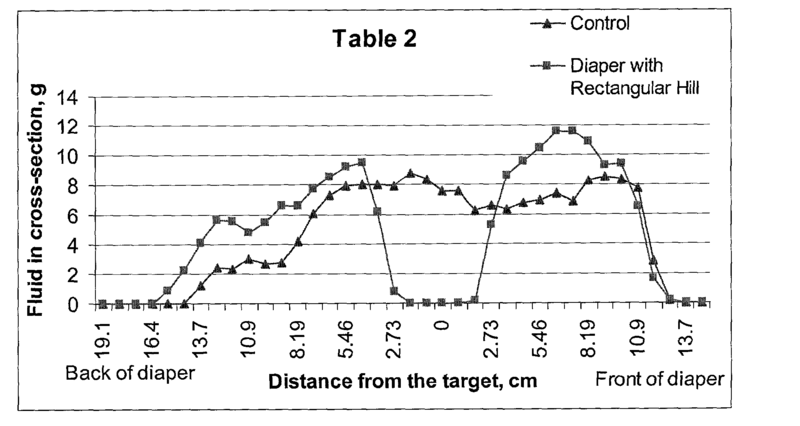 The diaper 10 further defines a longitudinal direction 36 and a lateral direction 38. Other suitable diaper components which may be incorporated in absorbent articles of the present invention include containment flaps, waist flaps, elastomeric side panels, and the like which are generally known to those skilled in the art. The various components of the diaper 10 are integrally assembled together employing various types of suitable attachment means, such as adhesive, sonic bonds, thermal bonds or combinations thereof. In the shown embodiment, for example, the topsheet  22 and backsheet 20 are assembled to each other and to the absorbent body 24 with lines of adhesive, such as a hot melt, pressure-sensitive adhesive. The adhesive may be applied as a uniform continuous layer of adhesive, a patterned layer of adhesive, a sprayed pattern of adhesive, or an array of separate lines, swirls or dots of adhesive. Similarly, other diaper components, such as the elastic members 26 and 28, fastening members 30, and ventilation and surge layers 32 and 34 may be assembled into the diaper article by employing the above-identified attachment mechanisms. The backsheet  20 of the diaper 10, as representatively illustrated in FIGS. 1 and 2, is typically composed of a substantially vapor permeable material. The backsheet 20 may be generally constructed to be permeable to at least water vapor and may have a water vapor transmission rate of at least about 1000 g/m2/24 hr, desirably at least about 1500 g/m2/24 hr, more desirably at least about 2000 g/m2/24 hr, and even more desirably at least about 2500 g/m2/24 hr. For example, the backsheet 20 may define a water vapor transmission rate of from about 1000 to about 5000 g/m2/24 hr. Materials which have a water vapor transmission rate less than those above usually do not allow a sufficient amount of air exchange and can undesirably result in increased levels of skin hydration if no other means of humidity reduction within the diaper is available. In one or more embodiments the backsheet  20 is also desirably substantially liquid impermeable. For example, the backsheet may be constructed to provide a hydrohead value of at least about 60 cm, desirably at least about 80 cm, and more desirably at least about 100 cm when subjected to the Hydrostatic Pressure Test. Materials which have hydrohead values less than those above undesirably result in the strike through of liquids during use. Such fluid strike through can undesirably result in a damp, clammy feeling on the backsheet 20 during use. The backsheet  20 may be composed of any suitable materials which either directly provide the above desired levels of liquid impermeability and air permeability or, in the alternative, materials which can be modified or treated in some manner to provide such levels. In one embodiment, the backsheet 20 may be a nonwoven fibrous web constructed to provide the required level of liquid impermeability. For example, a nonwoven web composed of spunbonded or meltblown polymer fibers may be selectively treated with a water repellent coating or laminated with a liquid impermeable, vapor permeable polymer film to provide the backsheet 20. In a particular embodiment of the invention, the backsheet 20 may comprise a nonwoven web composed of a plurality of randomly deposited hydrophobic thermoplastic meltblown fibers which are sufficiently bonded or otherwise connected to one another to provide a substantially vapor permeable and substantially liquid impermeable web. The backsheet 20 may also comprise a vapor permeable nonwoven layer which has been partially coated or otherwise configured to provide liquid impermeability in selected areas. Desirably, the backsheet will have a Water Vapor Transmission Rate of at least about 2,500 g/m2/24 hr. Examples of suitable materials for the backsheet  20 are also described in U.S. Pat. No. 5,482,765 issued Jan. 9, 1996 in the name of Bradley et al. and entitled “Nonwoven Fabric Laminate With Enhanced Barrier Properties”; U.S. Pat. No. 5,879,341 issued Mar. 9, 1999 in the name of Odorzynski et al. and entitled “Absorbent Article Having A Breathability Gradient”; U.S. Pat. No. 5,843,056 issued Dec. 1, 1998, in the name of Good et al. and entitled “Absorbent Article Having A Composite Breathable Backsheet”; and U.S. Pat. No. 6,309,736 issued Oct. 30, 2001 in the name of McCormack et al. and entitled “Low Gauge Films And Film/Nonwoven Laminates”, the disclosures of which are herein incorporated by reference. In a particular embodiment, the backsheet  20 is provided by a highly breathable laminate and more particularly by a microporous film/nonwoven laminate material comprising a spunbond nonwoven material laminated to a microporous film. The spunbond nonwoven comprises filaments of about 1.8 denier extruded from polypropylene or copolymer of propylene with about 3.5 weight percent ethylene and defines a basis weight of from about 17 to about 25 grams per square meter. The film comprises a cast coextruded film having calcium carbonate-filled linear low polyethylene microporous core and ethylene vinyl acetate and Catalloy™ polypropylene (Catalloy™ 357P), available from Basell (having offices in Wilmington, Del. ), blended skin layer having a basis weight of about 58 grams per square meter prior to stretching. The film is preheated, stretched and annealed to form the micropores and then laminated to the spunbond nonwoven. The resulting microporous film/nonwoven laminate based material has a basis weight of from about 30 to about 60 grams per square meter and a water vapor transmission rate of from about 3000 to about 5000 g/m2/24 hr. Examples of such film/nonwoven laminate materials are described in more detail in U.S. Pat. No. 6,309,736 issued Oct. 30, 2001 in the name of McCormack et al. and entitled “Low Gauge Films And Film/Nonwoven Laminates”, the disclosure of which has been incorporated by reference. The topsheet  22, as representatively illustrated in FIGS. 1 and 2, suitably presents a bodyfacing surface which is compliant, soft feeling, and nonirritating to the wearer's skin. Further, the topsheet 22 may be less hydrophilic than the absorbent body 24, to present a relatively dry surface to the wearer, and may be sufficiently porous to be liquid permeable, permitting liquid to readily penetrate through its thickness. A suitable topsheet 22 may be manufactured from a wide selection of web materials, such as porous foams, reticulated foams, apertured plastic films, natural fibers (for example, wood or cotton fibers), synthetic fibers (for example, polyester or polypropylene fibers), or a combination of natural and synthetic fibers. The topsheet 22 is suitably employed to help isolate the wearer's skin from liquids held in the absorbent body 24. Various woven and nonwoven fabrics can be used for the topsheet  22. For example, the topsheet may be composed of a meltblown or spunbonded web of polyolefin fibers. The topsheet may also be a bonded-carded web composed of natural and/or synthetic fibers. The topsheet may be composed of a substantially hydrophobic material, and the hydrophobic material may, optionally, be treated with a surfactant or otherwise processed to impart a desired level of wettability and hydrophilicity. In a particular embodiment of the present invention, the topsheet 22 comprises a nonwoven spunbond polypropylene fabric composed of about 2.2-2.8 denier fibers formed into a web having a basis weight of about 17 grams per square meter and a density of about 0.11 gram per cubic centimeter. Such a topsheet 22 may be surface treated with an effective amount of a surfactant, such as about 0.3 weight percent of a surfactant commercially available from Uniqema under the trade designation AHCOVEL BASE N-62. In one embodiment, no surfactant will be added to or incorporated into the composite material of the present invention, however, in an alternative embodiment, the liner or topsheet  22 of the diaper 10 may also be treated with a surfactant to promote wettability of the liner, thereby promoting the wicking of moisture away from the surface of the user's skin and improved skin health conditions. As noted above, in the alternative embodiment incorporating a surfactant, the fabric of the topsheet  36 may be surface treated with about 0.3 weight percent of a surfactant mixture which contains a mixture of AHCOVEL Base N-62 and GLUCOPON 220UP surfactant in a 3:1 ratio based on a total weight of the surfactant mixture. Other possible classes of surfactants include MASIL SF 19 and DC 193 Surfactant. The AHCOVEL Base N-62 is purchased from Uniqema (a division of ICI, and having offices in New Castle, Del. ), and includes a blend of hydrogenated ethoxylated castor oil and sorbitan monooleate. The GLUCOPON 220UP is purchased from Cognis Corporation and includes an alkyl polyglycoside. MASIL SF 19 and DC 193 Surfactant are purchased from BASF (Gurnee, Ill.), and Dow Corning (Midland, Mich.), respectively. MASIL SF 19 and DC 193 Surfactant are examples of typical ethoxylated polyalkylsiloxanes. The surfactant may be applied by any conventional means, such as saturation, spraying, printing, roll transfer, slot coating, brush coating, internal melt addition or the like. The surfactant may be applied to the entire topsheet 22 or may be selectively applied to particular sections of the topsheet 22, such as the medial section along the longitudinal centerline of the diaper, to provide greater wettability of such sections. The absorbent body  24 of the diaper 10, as representatively illustrated in FIGS. 1 and 2, may suitably comprise a matrix of hydrophilic fibers, such as a web of cellulosic fluff, mixed with particles of a high-absorbency material commonly known as superabsorbent material. In a particular embodiment, the absorbent body 24 comprises a matrix of cellulosic fluff, such as wood pulp fluff, and superabsorbent hydrogel-forming particles. The wood pulp fluff may be exchanged with synthetic, polymeric, meltblown fibers or with a combination of meltblown fibers and natural fibers. The superabsorbent particles may be substantially homogeneously mixed with the hydrophilic fibers or may be nonuniformly mixed. Alternatively, the absorbent body 24 may comprise a laminate of fibrous webs and superabsorbent material or other suitable means of maintaining a superabsorbent material in a localized area. The absorbent body  24 may be any of a number of shapes and may consist of one or more regions or areas which may or may not all be in contact with one another. For example, the absorbent core may be rectangular, I-shaped, or T-shaped. Examples of other shapes, orientations, and locations are described in more detail in commonly assigned U.S. patent application Ser. No. ______, entitled “AN ABSORBENT ARTICLE EXHIBITING IMPROVED FLUID DISTRIBUTION”, filed on Dec. 20, 2001, in the name of Wulz et al., the disclosure of which was previously herein incorporated by reference in its entirety. In general, absorbent body 24 may be provided by a single layer or, in the alternative, may be provided by multiple layers, all of which need not extend the entire length and width of the absorbent body 24. The size and the absorbent capacity of absorbent body  24 should be compatible with the size of the intended wearer and the liquid loading imparted by the intended use of the absorbent article. Further, the size and the absorbent capacity of the absorbent body 24 can be varied to accommodate wearers ranging from infants through adults. In addition, it has been found that with the present invention, the densities and/or basis weights of the absorbent body 24 can be varied. The high absorbency material or superabsorbent may be in any of a wide variety of geometric forms. As a general rule, it is preferred that the high absorbency material be in the form of discrete particles. However, the high absorbency material may also be in the form of fibers, flakes, rods, spheres, needles, or the like. In general, the high absorbency material is present in the absorbent body in an amount of from about 5 to about 90 weight percent, desirably in an amount of at least about 30 weight percent, and even more desirably in an amount of at least about 50 weight percent based on a total weight of the absorbent body  24. For example, in a particular embodiment, the absorbent body 24 may comprise a laminate which includes at least in part, and desirably at least about 50 weight percent and more desirably at least about 70 weight percent of high-absorbency material overwrapped by a fibrous web or other suitable means of maintaining the high-absorbency material in a localized area. As in conventional absorbent articles, due to the thinness of absorbent body  24 and the high absorbency or superabsorbent material within the absorbent body 24 of the present invention, the liquid uptake rates of the absorbent body 24, by itself, may be too low, or may not be adequately sustained over multiple insults of liquid into the absorbent body 24 (especially if one or more regions of an article or system are substantially free of absorbent material). To improve the overall liquid uptake and air exchange, a desired embodiment the present invention may further include the previously mentioned additional porous, liquid-permeable layer of surge management material 34, as representatively illustrated in FIGS. 1 and 2. The surge management layer 34 is typically less hydrophilic than the absorbent body 24, and has an operable level of density and basis weight to quickly collect and temporarily hold liquid surges, to transport the liquid from its initial entrance point and to substantially completely release the liquid to other parts of the absorbent body 24. This configuration can help prevent the liquid from pooling and collecting on the portion of the absorbent garment positioned against the wearer's skin, thereby reducing the feeling of wetness by the wearer. The structure of the surge management layer 34 also generally enhances the air exchange within the diaper 10. Various woven and nonwoven fabrics can be used to construct the surge management layer  34. For example, the surge management layer 34 may be a layer composed of a meltblown or spunbonded web of synthetic fibers, such as polyolefin fibers. The surge management layer 34 may also, for example, be a bonded-carded-web or an airlaid web composed of natural and synthetic fibers. The bonded-carded-web may, for example, be a thermally bonded web which is bonded using low melt binder fibers, powder or adhesive. The webs can optionally include a mixture of different fibers. Although the layer of surge material may itself be made up of one or more layers of materials, for purposes of this disclosure the surge layer shall be referred to, for descriptive purposes only, as one layer. The surge management layer 34 may be composed of a substantially hydrophobic material, and the hydrophobic material may optionally be treated with a surfactant or otherwise processed to impart a desired level of wettability and hydrophilicity. In a particular embodiment, the surge management layer 34 includes a hydrophilic, nonwoven material having a basis weight of from about 30 to about 120 grams per square meter. For example, in a particular embodiment, the surge management layer  34 may comprise a bonded-carded-web, nonwoven fabric which includes bicomponent fibers and which defines an overall basis weight of about 83 grams per square meter. The surge management layer 34 in such a configuration can be a homogeneous blend composed of about 60 weight percent polyethylene/polyester (PE/PET), sheath-core bicomponent fibers which have a fiber denier of about 2 and about 40 weight percent single component polyester fibers which have a fiber denier of about 3 and which have nominal fiber lengths of from about 3.8 to about 5.08 centimeters. In the illustrated embodiments, the surge management layer  34 is preferably arranged in a direct, contacting liquid communication fashion with the absorbent body 24. The surge management layer 34 may be operably connected to the topsheet 22 with a conventional pattern of adhesive, such as a swirl adhesive pattern. In addition, the surge management layer 34 may be operably connected to the absorbent body 24 with a conventional pattern of adhesive. The amount of adhesive add-on should be sufficient to provide the desired levels of bonding, but should be low enough to avoid excessively restricting the movement of liquid from the topsheet 22, through the surge management layer 34 and into the absorbent body 24 or second material 25. The absorbent body  24 is desirably positioned in liquid communication with surge management layer 34 to receive liquids released from the surge management layer, and to hold and store the liquid. In the shown embodiments, the surge management layer 34 comprises a separate layer which is positioned, at least in part, over another separate layer comprising the absorbent body 24 and/or the second material 25, thereby forming a dual-layer arrangement. The surge management layer 34 serves to quickly collect and temporarily hold discharged liquids, to transport such liquids from the point of initial contact and spread the liquid to other parts of the surge management layer 34, and then to substantially completely release such liquids into the layer or layers comprising the absorbent body 24. The surge management layer  34 can be of any desired shape. Suitable shapes include for example, circular, rectangular, triangular, trapezoidal, oblong, dog-boned, hourglass-shaped, or oval. In certain embodiments, for example, the surge management layer can be generally rectangular-shaped. In the illustrated embodiments, the surge management layer 34 is generally coextensive with the absorbent body 24. It is, however, contemplated that in on or more embodiments the surge management layer 34 may extend over only a part of the absorbent body 24. Where the surge management layer 34 extends only partially along the length of the absorbent body 24, the surge management layer 34 may be selectively positioned anywhere along the absorbent body 24. For example, in some embodiments, the surge management layer 34 may function more efficiently when it is offset toward the front waist section 12 of the garment. The surge management layer 34 may also be approximately centered about the longitudinal center line of the absorbent body 24. Additional materials suitable for the surge management layer  34 are set forth in U.S. Pat. No. 5,486,166 issued Jan. 23, 1996 in the name of Ellis et al. and entitled “Fibrous Nonwoven Web Surge Layer For Personal Care Absorbent Articles And The Like”; U.S. Pat. No. 5,490,846 issued Feb. 13, 1996 in the name of Ellis et al. and entitled “Improved Surge Management Fibrous Nonwoven Web For Personal Care Absorbent Articles And The Like”; and U.S. Pat. No. 5,364,382 issued Nov. 15, 1994 in the name of Latimer et al. and entitled “Absorbent Structure Having Improved Fluid Surge Management And Product Incorporating Same”, the disclosures of which are hereby incorporated by reference. As noted above, the majority of the disclosure herein is directed to a absorbent article and more specifically a diaper; however, the scope of the present invention is not to be limited thereby in any manner inconsistent with the claims. For example, although not illustrated, another embodiment of the present invention is directed to a composite which defines a front waist section, a rear waist section, and an intermediate section which interconnects said front and rear waist sections, each section having one or more regions. The system includes a vapor permeable backsheet which defines a WVTR of at least about 1000 g/m 2/24 hr; a liquid permeable topsheet; an absorbent body located between the backsheet and the topsheet; and at least one undulation of resilient material located between the backsheet and the topsheet. The at least one undulation will be of sufficient elevation to provide for the movement of a fluid away from a region of the absorbent article and/or a change in the fluid profile of the article. The change in the fluid profile of the article may provide for a reduction in skin-exudate contact and may also provide reduced saturation in the insult or target area. The undulation is desirably a hill or a slope of material which provides for the direction of fluid to one or more portions of the absorbent article, and more desirably for movement from the crotch and/or insult regions of the article. The absorbent body or material may also be absent or essentially absent from one or more regions of the article, including the crotch and insult or target areas of the absorbent article. The composite may also further include a vapor barrier positioned between the absorbent or surge and the topsheet, wherein the vapor barrier reduces or minimizes the moisture movement between from the absorbent core into environment between the absorbent article and the user's skin. It is contemplated that the backsheet is comprised of a highly breathable laminate, and more desirably a film/nonwoven laminate. Even more desirably the nonwoven portion of the laminate may be a spunbond material. It is further desirable in some embodiments of the present invention for the backsheet to have a WVTR value of at least about 2,500 g/m2/24 hr. It is contemplated that the composite may be a personal care product, such as a diaper, training pant, absorbent underpant, adult incontinence product, feminine hygiene product, hygiene and absorbent product or the like. The present invention also contemplates a diaper including a vapor permeable outercover having a WVTR of at least about 1000 grams/m 2/24 hr; a liquid permeable liner; an absorbent body located between the outercover and the liner, the absorbent body located in one or more regions of the article; a surge layer or surge material located between the outercover and the liner; a vapor barrier between the absorbent body and the liner; and a resilient material, the resilient material being positioned in the intermediate section of the diaper and being of sufficient elevation so as to promote flow of an insulting liquid to one or more other sections of the diaper so as to change the fluid profile in the diaper. The vapor barrier is desirably a film, and is designed to help reduce the movement of moisture from the absorbent core into the area between the absorbent article and the user's skin, such that contact with the wearer's skin is minimized or reduced. Generally, the vapor barrier should not be present in the area above the resilient material of the product. Further still, it is desirable for the vapor permeable outercover to be substantially liquid impermeable. While various patents and other reference materials have been incorporated herein by reference, to the extent there is any inconsistency between incorporated material and that of the written specification, the written specification shall control. In addition, while the invention has been described in detail with respect to specific embodiments thereto, it will be readily apparent to those skilled in the art that various alterations, modifications and other changes can be made without departing from the spirit and scope of the present invention. It is therefore intended that the claims cover or encompass all such alterations, modifications and/or changes. a resilient material positioned above the absorbent material, wherein the resilient material creates at least one contour. 2. The absorbent article of claim 1, wherein the resilient material promotes movement of fluid away from one area of the article to another area of the article. 3. The absorbent article of claim 1, wherein the resilient material is positioned between topsheet and the backsheet. 4. The absorbent article of claim 1, wherein the resilient material is positioned on top of the topsheet. 5. The absorbent article of claim 1, wherein the intermediate section comprises, at least in part, a crotch region and wherein the resilient material is located in the crotch region of the article. 6. The absorbent article of claim 1, wherein the contour of resilient material creates at least one hill-like structure. 7. The absorbent article of claim 1 further comprising a surge material, said surge material being positioned between the topsheet and the backsheet. 8. The absorbent article of claim 1, wherein at least an area of at least one section of the article contains less absorbent than another area of the article. 9. The absorbent article of claim 1, wherein the absorbent is absent from the crotch region of the diaper. 10. The absorbent article of claim 1, wherein the absorbent is absent from the area of the article where the resilient material is positioned in the article. wherein said vapor barrier reduces the amount of evaporative moisture the skin of a wearer is exposed to. 12. The absorbent article of claim 1, wherein the topsheet is liquid permeable. 13. The absorbent article of claim 1, wherein the backsheet is vapor permeable. 14. The absorbent article of claim 1, wherein the resilient material which promotes movement of fluid away from one area of the article to another area of the article comprises a foam-like material, elastomer, thermoplastic, open or closed cell foam, or plastic composites. 15. The absorbent article product of claim 1 is a personal care product. 16. The personal care product of claim 15, wherein the personal care product is selected from a diaper, training pant, absorbent underpant, adult incontinence product, sanitary wipe, wet wipe, feminine hygiene product, wound dressing, bandage, and mortuary and veterinary wipe, hygiene and absorbent product. d) at least one undulation of resilient material located between said backsheet and said topsheet. 18. The composite of claim 17, wherein the at least one undulation is of sufficient elevation to provide for the movement of a fluid away from a region of the composite. 19. The composite of claim 17, wherein the at least one undulation is a hill or slope of material which provides for the direction of fluid to one or more regions of the composite. 20. The composite of claim 17, wherein the absorbent is essentially absent from one or more regions of the composite. 22. The composite of claim 17, wherein the absorbent is essentially absent from the crotch region of the composite. 23. The composite of claim 17, wherein the backsheet is comprised of a highly breathable laminate. 24. The composite of claim 23, wherein the highly breathable laminate is a film/nonwoven laminate. 25. The composite of claim 24, wherein the nonwoven is a spunbond. 26. The composite of claim 17, wherein the backsheet has a WVTR value of at least about 2,500 g/m2/24 hr. f) a resilient material, said material being positioned in the intermediate section of the diaper. 28. The absorbent article of claim 27, wherein the resilient material has sufficient elevation so as to provide for the flow of an insulting liquid to one or more other regions of the diaper so as to change the fluid profile in the diaper. 29. The absorbent article of claim 27, wherein the absorbent body is absent from the insult area of the absorbent article. 30. The absorbent article of claim 27, wherein said vapor permeable outercover is substantially liquid impermeable. MXPA04005281A MXPA04005281A (en) 2001-12-20 2002-10-23 An absorbent article having an insert providing for improved fluid distribution. ZA200404469A ZA200404469B (en) 2001-12-20 2004-06-07 An absorbent article having an insert providing for improved fluid distribution.